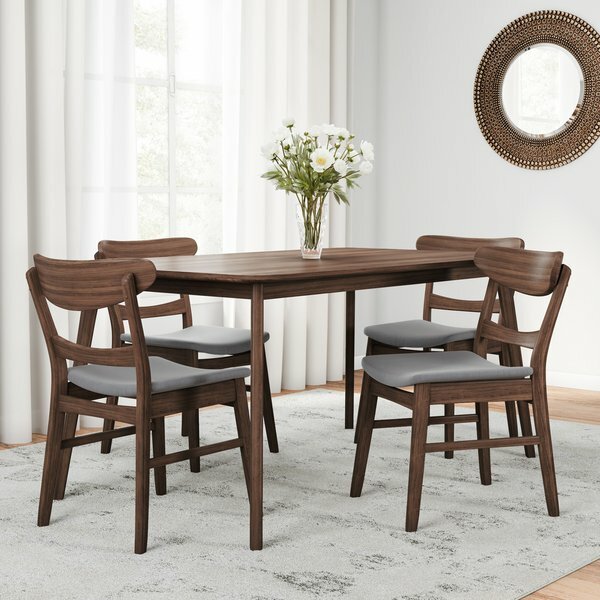 Crafted to complement the decor of virtually any small dining space with mid-century flair, this five-piece dining set comes with four chairs and a round dining table. The chairs are curved to conveniently tuck right under the table. Finished in a warm walnut with easy to clean black faux leather upholstered seats, this set is constructed of sturdy rubberwood for increased durability. 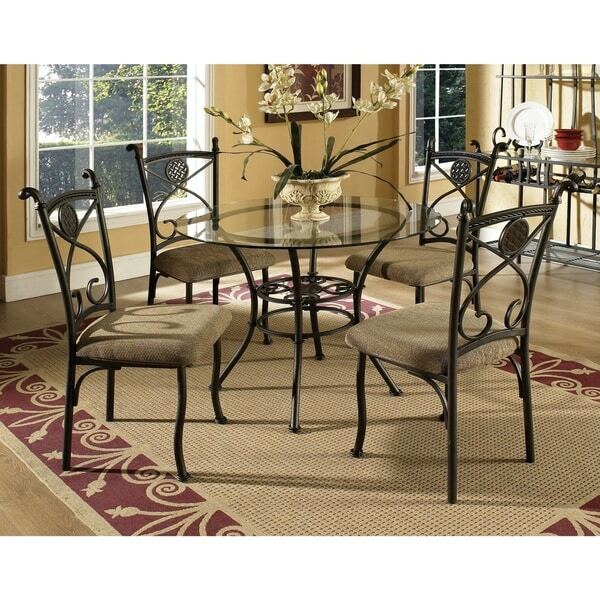 Create a beautiful interior dining space with this stylish and contemporary 5-piece dining set. Save space with the matching ottomans that feature a convenient storage capacity. Constructed of particleboard with laminated reclaimed look finish, vinyl and foam, you can choose from two weathered finishes that best match your home decor. This Ticknock dining set from Copper Grove features the kind of rustic appeal that can instantly transform your kitchen or dining room into the kind of old-world scene from the vacation of your dreams. The frame of each piece is made of metal with a dark brown powder-coat finish that protects from scratching and enhances the rustic detailing. The chairs are upholstered in a calming beige fabric reminiscent of Tuscan Italy. Note: The baker’s rack is included in the six-piece set, not the five-piece set. 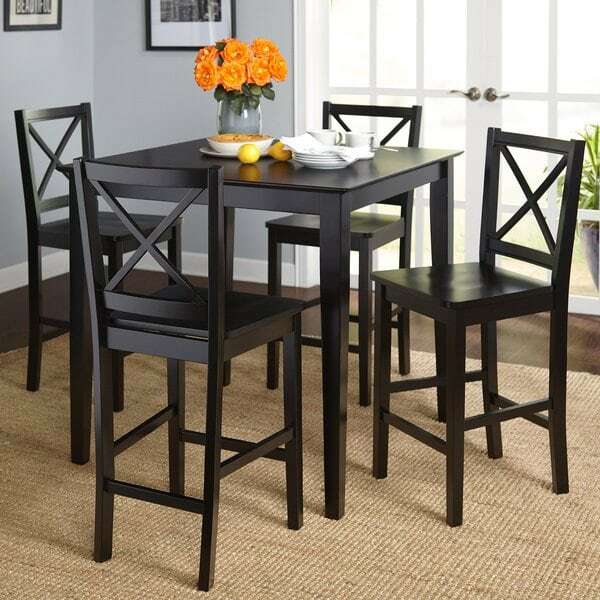 Create a mid-century vibe in your dining area with this lovely Grisslehamm dining set from Carson Carrington. The table is crafted from MDF and rubberwood with walnut veneers, and features a spacious tabletop raised over angular legs. Each of the four rubberwood chairs features a ladderback design with a curved toprail, angular legs and a fabric cushion that is available in a variety of trendy colors. 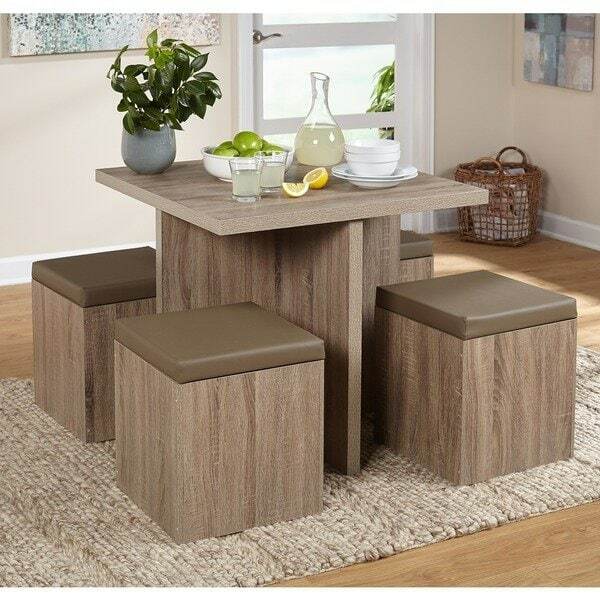 The set comes in your choice of natural walnut or natural oak finish.